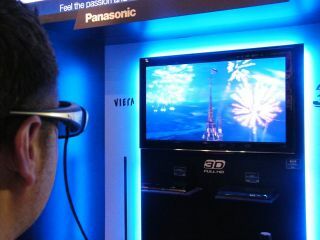 Panasonic has finally unveiled its 3D television range which will enter the UK market – the Viera VT20 plasma series. Deciding to only use plasma technology to power 3D, the brand-new Viera plasma range comprises five televisions one of which is 3D-compatible. Boasting higher efficiency, better image quality and lower power consumption than their predecessors, the VT20 (3D ready) and V20 ranges offers 600Hz Sub-field Drive technology (for smoothness), high-speed drive technology (for better and quicker brightness) and a new phosphor shortens afterglow time (which has been dramatically reduced). All the plasmas have a native contrast ratio of 5,000,000 to 1 and are THX Certified Displays. Also inside is both Freeview HD and Freesat HD tuners. When it comes to web connectivity, Viera Cast is on board and the TVs are DLNA certified. The V20 series has all of the both but a lack of 3D compatibility. The V20 range will be available in both 37-inch and 42-inch flavours. The other plasma TVs in the range include the G20 (not to be confused with the summit), the S20 and the X20. The G20 range comes in 50-inch, 46-inch and 42-inch sizes, features a 600Hz Sub-field Drive Intelligent Frame Creation Pro, a native contrast ratio of 5,000,000:1 and has Viera Cast connectivity. The S20 is available in 50-inch, 46-inch and 42-inch models. The specs list is similar to the G20, except that contrast resolution is a little lower at 2,000,000:1. Viera Cast is also not included on the S20 range, but you do get Viera image viewer and Viera link. The final plasma TV is the one which delivers the best imaging quality, according to Panasonic. The X20 is primed with 100-Hz Double Scan, dynamic contrast of 2,000,000:1, VIERA Image Viewer for motion picture playback, and VIERA Link. The panel is also said to be eco friendly, as it is lead-free and offers a long, 100,000-hour service life. Pricing and UK release date are still to be confirmed, but as there's Freeview HD on board on some of the models and the World Cup just around the corner, expect them to be in the shops around May time.